We are improve the translation of the short VA to Portuguese, specifically, the questions adult_2 7 and adult_2_10. Would you send us the tariffs of these symptoms? They will help us so much. I’ve attached a spreadsheet that includes all signs and symptoms in this format. Can I publish your question and my answer on my blog https://healthyalgorithms.wordpress.com ? I think this sort of thinking will be helpful for others doing VA translation work. Thank you for your interest in this work. I have an easy answer for your second question: for anything that is a “select multiple” question (see the “type” column of the “survey” sheet in the xls form), you can encode multiple selections as a space-separated list, i.e “1 2” for cigarettes and pipe. In order to answer your first question, I think I need more information. Can you give me an example of what you are trying to do? It also be helpful if you can try it, and let me know what goes wrong if it does not work. Here is another little detail for the detail-oriented mapper who is trying to get data into SmartVA-Analyze: agedays. In the tutorial, I mentioned that there are handful of additional columns that are not in the Guide, because they are created automatically by the ODK form. The one called agedays is a bit important, because it gets used to determine if the age of the deceased is above or below a threshold. So set it! The important things currently are if it is more or less than 300 and if it is more or less than 3. There is a major challenge in using this tool (now called SmartVA-Analyze 1.1), however, which is getting the necessary data to feed into it. If you use the ODK form to collect data in just the right format, it is easy. But electronic data collection is not always possible. And there is a fair amount of data out there that has already been collected, but not yet analyzed (which is some of the motivation for creating this tool in the first place). This blog describes the process of mapping existing VAI data into a format that can be used as input to SmartVA-Analyze 1.1. It is a challenging process that requires careful attention to detail. I will demonstrate the basics here, and I hope to provide fuller examples in multiple scripting languages as researchers complete this exercise for themselves. But if you have data that was collected with pencil-and-paper and then laboriously digitized, you will need to map it into that format. This Guide for data entry spreadsheet is your Rosetta Stone. 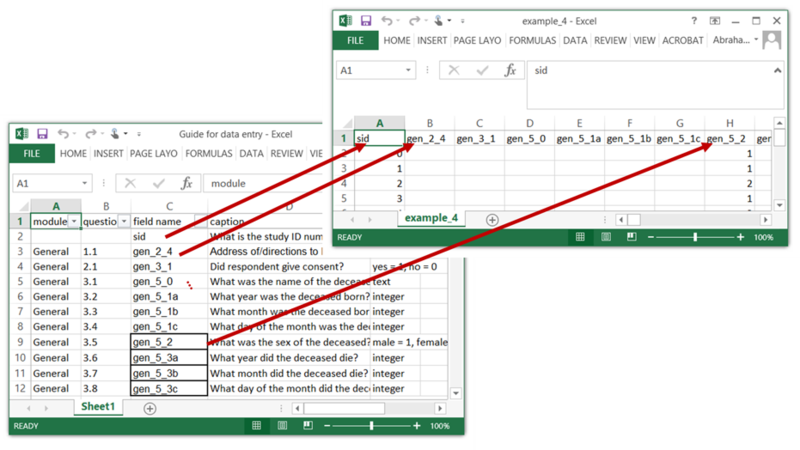 SmartVA-Analyze 1.1 expects the input csv file to have a column for every row in that spreadsheet, with column heading matching the entry in the “field name” column. I like to use Python with Pandas for doing this kind of work, but I recommend you use whatever scripting language you are most comfortable with. But I strongly recommend that you use a script to do this mapping. It will be much easier to debug and reproduce your work than if you do the mapping by hand! (I also recommend that you work incrementally and use a revision control system…) To learn more about the Python/Pandas approach, I recommend the book Python for Data Analysis. Mapping a more substantial dataset, even a the following hypothetical example is an idiosyncratic and time-consuming procedure. Mapping more columns proceeds analogously, but I recommend working incrementally, so at this point you should save the partially mapped data and make sure it runs through the SmartVA-Analyze app, and make sure that the results make some sense. 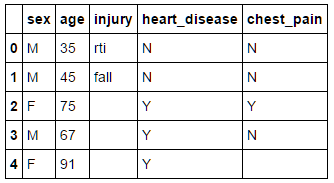 For example, in this case the mapped hypothetical data from the first 2 rows are correctly identified as traffic and fall injury deaths, but the final 3 rows are undetermined (because non-injury signs and symptoms have not yet been mapped). I hope that this helps… if you’ve read this far, you probably have a hard job ahead of you! Please see the Jupyter Notebook version of this example here, and good luck! 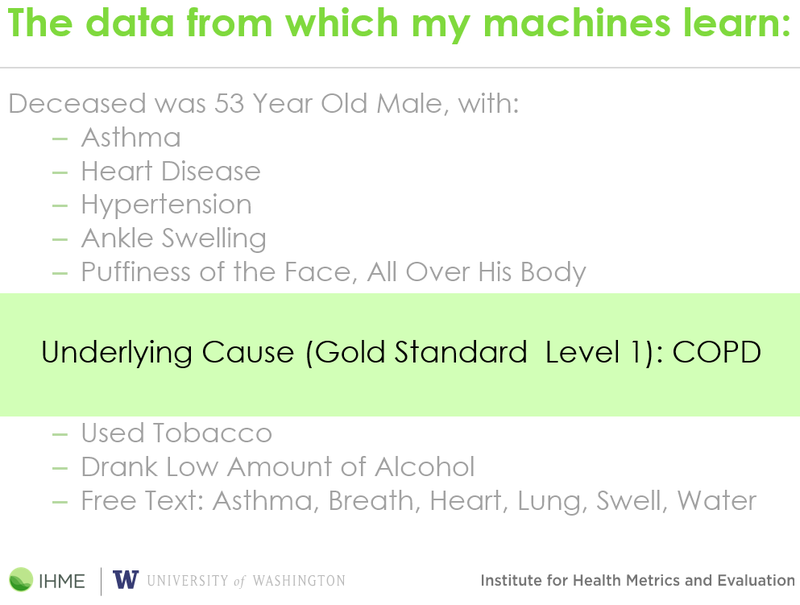 I gave a talk on automatic methods to map from verbal autopsy interview results to underlying causes of death last August, and I like the slides so much that I’m going put them online here. 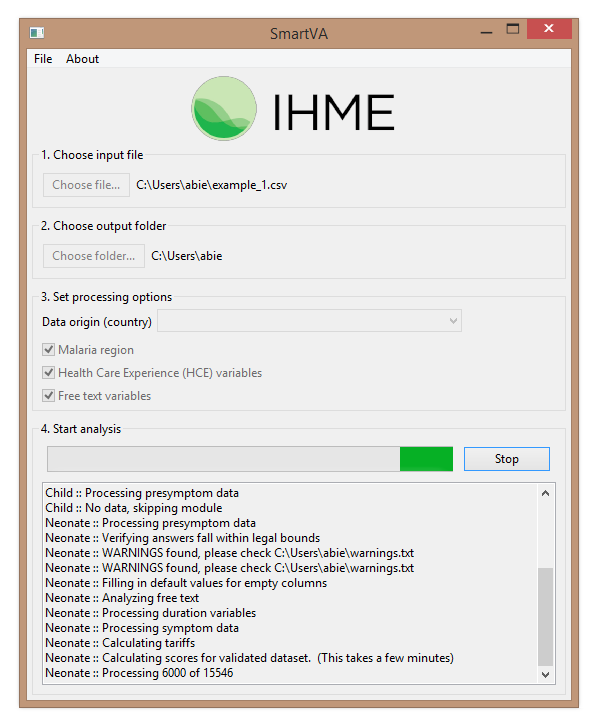 Cheers to the new IHME themed templates for Power Point!